The Best Books Ever: A Touch of Magic: Excerpt + Giveaway! A Touch of Magic: Excerpt + Giveaway! Thanks to author Gregory Mahan, we're pleased to offer an excerpt from his YA fantasy novel A Touch of Magic, as well as an international giveaway for an audiobook version of the story! Keep reading for more! What's a young mage to do in a land where magic is illegal, and the penalty is death? At the age of fourteen, Randall Miller is surprised to learn that he has the talent--for magic! Tricked into apprenticeship by a powerful Mage, Randall is forced to leave everything he knows behind. Power welled up within him in a painful pulse behind his forehead, and then it lashed out just as swiftly. It wove itself into the words, gave them purpose, and spread out in all directions, as far as Randall’s voice would carry. And all within the sound of that voice were struck insensible. Soldiers dropped their swords and wandered off. One man sat down heavily and gnawed on the rock he was holding, as if it were an apple. One soldier hugged himself tightly, weeping. Two other men started shoving each other until it escalated into a fistfight. But one man never dropped his eyes from Randall at all. And slowly, he began clapping. Randall was exhausted. He felt almost as drained as when he had changed the parchment into dwarven steel. The tip of his sword dug into the ground, and gravity threatened to pull it from his fingers. All of these years? Randall was confused. He’d only been apprenticed with Erliand since spring of last year. “Shame it has to end right as it was getting good,” the herald continued, bringing his hand from beneath his tabard. It held thick ebony wand, nine inches long. Symbols were inlaid in silver around it, and a long splinter of ruby was lashed to the tip. Randall cried out and threw his arms up instinctively as the herald pointed the wand at him and barked a short word. Randall felt very little power being summoned, but a huge column of flame roared out from the wand. It stopped inches away from Randall, as if the flames were lapping against an invisible wall. Unable to hold himself up without help, Randall toppled backward into the dirt. He turned the wand on Erliand and loosed another gout of flame. Erliand sung a soft word, drowned out by the roar of flame, and the flame again smashed against the same kind of invisible shield which had protected Randall moments before. Helplessly, Randall watched the scene unfold before him, as if in a dream. It was all he could do to keep himself from passing out as the two Mages battled, throwing and deflecting arcane energies back and forth. Randall felt so insignificant compared to the power wielded by the two Mages that he fell to his knees and cowered, whimpering before it. He knew he was feeling the side effects of being in the presence of so much gathered magic, but that didn’t matter. His heart hammered just the same, and he sat there frozen. He wasn’t the only one feeling the effects, either. All around the fighting Mages, those townsfolk that Randall had struck senseless were fleeing the area, their animal instincts taking over from their higher brain functions. Randall was shocked out of his reverie when the herald was able to take advantage of a momentary opening in the battle to loose another column of flame in Randall’s direction. Erliand was unable to shield it, but Randall rolled out of the way at the last minute. His energy was coming back quickly, thanks to the talisman still tucked into his tunic. Then keep reading to enter to win an Audible audiobook copy of the novel! This giveaway is open internationally, to anyone who can redeem a gift code from Audible. The book was professionally narrated by David Stifel. He has played in several Hollywood films, such as The Number 23, Minority Report, A Life Less Ordinary, the Spongebob Squarepants movie, among others. The narration runs a little over 11 hours. 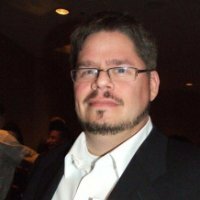 Gregory Mahan was born in Richardson, Texas, but spent the majority of his life in and around the greater Houston area. Gregory fell in love with the works of Andre Norton at a very young age, and soon became a voracious reader of science fiction and fantasy works. He began crafting stories for his friends and family at the age of 8 when he asked for (and received!) a typewriter as a Christmas gift. 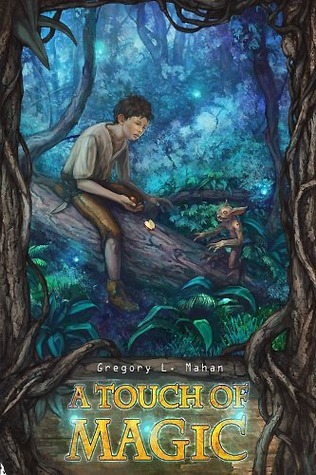 A Touch of Magic is Gregory's first published full-length novel. In addition to writing, he enjoys Celtic music, and has played the Irish penny whistle and low whistle since 1995. His first band, Echoes of Ireland, was featured on KPFT radio's Irish Aires program, as well as being one of the bands chosen to play for Charles Sheehan, Consul General of Northern Ireland on his visit to Houston in 2003. Gregory maintains one of the oldest and largest Irish music repositories on the internet, The Wandering Whistler Music Archives, and published his first songbook, Fifty Great Celtic Jigs, in 2002. In 2003, he joined the band Paddy Gone Wild, and was prominently featured on their CD, The Greatest Hits, released in 2008. Gregory currently lives in Northern Virginia with his family.